The Hoxton Hotel is playing host to a pop-up barbershop from Murdock in late September, for 5 days. No singing (sadly) just lots of great haircuts, beard trims - essential in Hoxton - and shaves, from Wednesday to Sunday. "The Hoxton Hotel is joining forces with another Shoreditch institution this September, Murdock London who will be cutting hair, trimming beards and styling ‘tashes live from the lobby. Murdock London, a primary destination for the man about town was established in Shoreditch in 2006, the very same year the Hoxton Hotel opened its doors to welcome guests. The pop-up takes place over five days from Wednesday 25th September, right beside the fireplace in front of lobby’s huge windows. 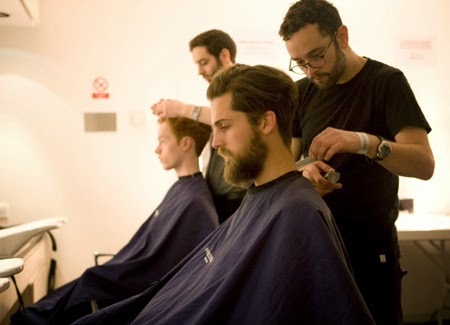 Opening at 9am each day the pop-up salon will offer express cuts - perfect for lunch hour slots, beard trims, wet shaves and moustache trims to the masses. There will also be a range of Murdock London signature shaving products available to purchase. Anyone booking an appointment will also be offered a 50% discount on food and drink -during the pop-up opening hours - from the Hox Grill when they sign up to the Hoxton friends mailing list, make like a man and check out the pulled pork bap or juicy burger. Advance booking is advised by emailing customerservices@murdocklondon.com and appointments are available from 9am – 5:30pm. - Traditional Wet Shave: £45 (45 mins)"